New projects are set to boost the hiring of IT staff in Christchurch in 2014 with 85% of employers planning to recruit in next 6 months. The rapid local growth currently being experienced in Christchurch is a result of unique collaborations and an innovative spirit, which is opening doors and opportunities for serious development and long-term growth. In the next six months it is expected there will be high demand for certain roles that reflect the strong product development and export focus of the Christchurch IT sector. Christchurch is a city rich with start-ups and innovators. With a focus on export markets and large-scale projects, local IT offers something different to vendor-driven Auckland and public sector-focused Wellington. Added job security is forecast with contract positions expected to make up less than 5% of available roles in the next 6 months. The focus on creating the right culture in a team remains a priority in the Christchurch IT sector. Over 96% of employers say the right ‘fit’ is very important and can even overshadow the most qualified candidate. This is positive for candidates as it creates a good working environment that often includes several benefits. Local employers treat their staff well, with most offering additional benefits to create attractive employment packages. 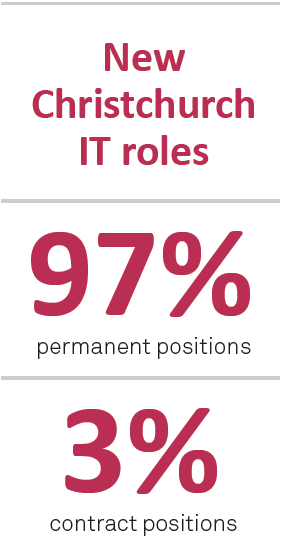 Over 70% of those working in the Christchurch IT sector receive additional benefits in their current roles. Smaller and start-up organisations, which make up 18% of the market, are usually more flexible in meeting individual worker needs. Other benefits include additional annual leave, overtime, additional superannuation, vehicle/ vehicle allowance and gym/sports membership. Some organisations even offer equity/stock options, childcare and breakfast/fresh fruit each day. Employees know what they want in their roles and many of them are very satisfied with their employment as a result. There is a lot of activity in the local market with exciting and innovative projects, which is a chance for employees to enjoy unique challenges and career opportunities with flexible and supportive workplaces.